We’ve developed a plan for Bankstown that encourages more jobs and businesses, new shops, cafes and restaurants, and improved transport. Have your say. The Sydenham to Bankstown Corridor Urban Renewal Strategy provides a planned approach to growth, with infrastructure delivery and development co-ordinated along the corridor. Bankstown will continue to provide shops, jobs and community services for the wider corridor to support the District Centre’s employment target. A potential station square will be the heart of Bankstown Station Precinct enhancing pedestrian activity and providing new north-south connections. Future development around the station will provide a visual marker for Bankstown Station Precinct. Bankstown CBD will be renewed and modernised as it redevelops for increased jobs and homes. 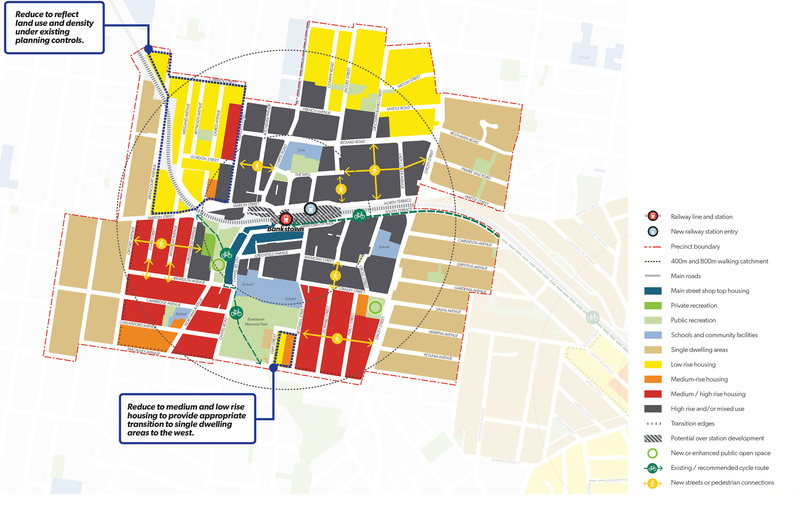 This map shows the key changes that have been made to the Bankstown Station Precinct Plan as a result of your feedback. The Department of Planning and Environment (DP&E) is preparing a concept landscape master plan for a shared pedestrian and cycle link and linear park should surplus rail land become available. Public Domain and Station Access Plan Sydney Metro will prepare a Public Domain and Station Access Plan for improved station design, accessibility and interchange with other modes of transport. Bankstown Airport DP&E are working with City of Canterbury Bankstown to obtain an ‘in-principle’ strategic approval for building heights to create greater development certainty. Transport Interchange Sydney Metro are working with City of Canterbury Bankstown to develop options for an improved interchange. Revitalising Bankstown City Centre is important and it needs to be family-friendly with a modern shopping centre, out-door dining, night time activity and improved safety. A community centre should be planned for Bankstown and infrastructure improvements need to include road, public transport and cycleway improvements and increased hospital capacities. You have mixed feelings about increased building heights in Bankstown. Some thought it will help the precinct become a strategic western centre for Sydney. Traffic congestion and parking issues need to be addressed. More detailed information on your feedback can be found in the Bankstown Station Precinct Plan.